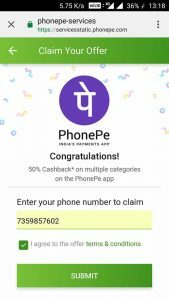 Trick to Get Rs 75 PhonePe Cash Absolutely Free (All Users)!! – One of the most loved seasons is going on in India and almost the whole globe loves watching it live. What I’m talking about? Any Guess?? Yeah, it’s Indian Premier League (IPL 2018). Hotstar is the official live broadcasting partner and as always, this time it’s back with a new concept where users can not only watch live IPL but also play along and win some really great rewards including a Brand New Car!! Users can Watch IPL and Play Along to Win Some Really Big and Cool Prizes which includes Gift Vouchers, PhonePe Cash and also a Brand New Car. You just have to watch live IPL on Hotstar and at the same time, they will throw questions which you have to guess and answer i.e., something like Predict and Win. There will be levels and for completing each level, you will win some assured prize. And completing the very first level, which is really very easy, you will get Rs 75 PhonePe Cash Absolutely Free but for that, you need to follow the trick below. So let’s carry on. Step 2: Login to Hotstar app using Facebook. Step 4: Tune and start watching Live IPL on Hotstar App. And at the below half section, you will see Watch N Play where you will be thrown with some questions on each ball in the live game. Most of the questions will be based on next ball score. So judge/guess/predict and answer the question. If your prediction goes right then you will get Hotstar Points. Step 5: Clear the first level which will get cleared right on the first 1-2 correct answer. The level prize is 50% Cashback upto Rs 75 on PhonePe. Once you win it, click on Claim and it will take you to a new page where you have to enter your PhonePe Registered Mobile Number. Step 6: Enter PhonePe Number and click on Submit button. This offer will be activated on your PhonePe Account. Step 7: Now Download or Update PhonePe App and Open it. Step 8: You will see the Hotstar PhonePe Offer Banner on Dashboard which means the offer is activated for you. Now let’s initiate a transaction to avail the cashback. Offer: 50% Cashback on one transaction upto Rs 75. So let’s make a transaction of Rs 150. Don’t worry, you will get back your Rs 150 too. 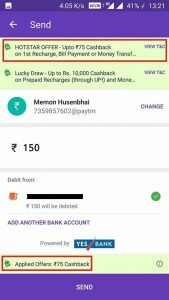 Step 9: Click on Send Money option and send Rs 150 to your own UPI of Paytm/BHIM/FreeCharge or any other or you can also send to your friend’s account. Step 10: The Hotstar Offer will be auto-applied and once you complete the transaction, Rs 75 Cashback will be added instantly. This way, we completed the offer without actually doing any investment. Also, Rs 75 Cashback is added absolutely free. Get 50% cashback up to ₹75 on your first transaction on the PhonePe app in the offer window. 7th April 2018 (19:00:00 Hours) to 5th June 2018 (23:59:59 Hours). Users who complete Level 1 of the Game on Hotstar and enrol with their mobile number will be eligible for the offer. This offer can be availed once per user/device /bank account/debit card/credit card. 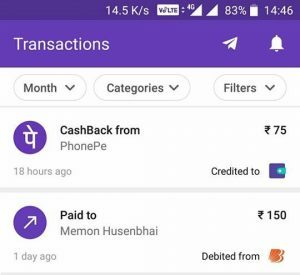 Cashback can be used for merchant payments made on the PhonePe platform – this includes recharges, bill payments and for merchants where PhonePe is a valid payment option.